The highland Maya live within the rhythm of the seasons and keep up the elaborate round of religious festivals. Living between earth (tierra) and sky (cielo), and depending upon the sun and rain and fertility of the land, they have a deep respect for nature, and most households engage in the sacred duty of corn farming. There is an elaborate calendar of celebrations. These vibrant fiestas turn even the remotest Maya village into an explosion of color and noise, with locals in wonderful costumes, traditional music and dances, processions, fireworks, horse races through the streets … It is a truly unforgettable experience. 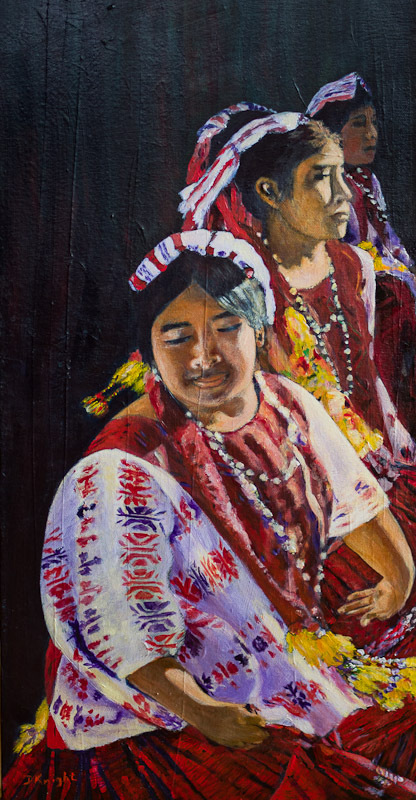 The colors and the movement drew me to paint these Mayan dancers. As I studied their strong faces and traditional attire, my admiration and respect grew for this ancient culture that too few of us have the opportunity to experience. They are indeed the lucky ones. I love everything about these ladies… an interesting painting & as always, i’m captured.